We often forget how much of Guilford’s prosperity depends upon the sea, with its tangy breezes and hidden treasures. Harvesting the bounties of fish and shellfish from Long Island Sound is a practice older than the old town itself. Indeed, Native Americans for 1000, 5,000, and 8,000 years before the town’s founding practiced this form of agriculture. Eastern Woodland Indian tribes established summer encampments on our shores in these prehistoric eras. They dug clams and oysters and netted fish for a mainstay of their diets. When Reverend Henry Whitfield and his company of English Puritans founded the town (1639), they found heaps of shells on the cleared flat lands or “Great Plain” of Guilford, below what is now Guilford Green. Town legislation as early as 1753 recognized the importance of Guilford’s rich shellfish beds, when the “preservation of oysters” was addressed, so “that they may not be unnecessarily dispoil’d and destroyed.” No person was allowed to export oysters from the East River beds under penalty of a shilling per bushel. By 1766, the town established a “closed” season for taking oysters, May 1 until September 15. “Oyster culture” or the harvesting of oysters is addressed as early as 1828, when anyone could plant oysters and clams below high water mark as their property. By 1876, the Selectmen were authorized to lease oyster grounds in East and West Rivers. Several years later, the town voted to lease to Horace Fowler 300 acres of ground in Long Island Sound for the purpose of oyster culture, charging him one dollar per acre. Early in the last century, Levi Thrall of Whitfield Street was a well known oysterman, using a long, narrow, flat-bottomed work boat known as a “Sharpie.” The usual method for harvesting oysters was to dredge the river bottom at low tide with an oyster rake. This device was fabricated like two ordinary rakes with sharp teeth hinged in the form of a pair of scissors. In the 1950s, oysters were so plentiful that West River was choked up with oysters growing on top of one another in what were called cones. Often, cones reached the length of 20 inches or more from the original set. Now, as then, shell fishing is an important component of Connecticut’s economy and its recreation and tourism industries. The Guilford Shell Fish Commission works with the State of Connecticut to stock areas for harvest by the public. These areas include Great Harbor, Chaffinch Island, Shell Beach and Little Harbor. Over 1100 licenses for recreational shell fishing are issued annually, with sliding fees ($15–$75) based on residency. Full time “wardens” educate the public and enforce regulations. Commercial shell fishermen lease underwater grounds from either the local Commission or State, depending upon jurisdictional boundaries. A young man named Christopher Walston, who graduated with the Guilford High School class of 1994 and earned a college degree in aquaculture, is one of Connecticut’s distinguished commercial clammers (C.W. Shellfish, LLC). His method of seeding and harvesting clams on a large scale is singularly unique. Underwater polypropylene screens framed onto steel bars (rebar) are laid over his clam beds for storm protection and also to prevent the common predators of clams: blue crabs and winkle snails. Like most farmer-fishermen in coastal Connecticut towns, Guilford farmers long ago consumed fish in their farm operations. And it was not always for a food supply, but for the seasonal function of fertilizing corn fields or other crops. President Timothy Dwight of Yale College kept a detailed travelogue as he visited shoreline towns in the year 1800, referring to “fields extensively manured with white-fish” in Guilford. Such fish, often known as menhaden or bunker, still inhabit the Sound in schools with ranges extending up our tidal rivers. Native Americans aptly named the seat of their encampment here, Menunkatuck, after the river with the same name, i.e. Menunkatuck (West River), whose English translation is “place of the Menhaden.” Dwight wrote that “ten thousand [Menhaden] are considered as a rich dressing for an acre” of land. In 1817, the brothers Christopher and Samuel Spencer established a wharf on their expansive waterfront tract at “The Pipe” (Indian Cove) section of Guilford for fishing with seine nets. By 1835, the Spencers leased this site to the “Pipe Seine Fishing Company.” Under lease from the Spencers, the Fowler and Colburn Fish Oil Works prospered at The Pipe, 1873–1882, bringing fish ashore in sloops called lighters, to be unloaded into a large hopper, from which they ran by cars up an inclined rack to tanks for steam cooking. Fish oils were extracted by large presses to be used in the manufacture of paints. Scraps were ground and sold as guano fertilizer. In 1878, the Shore Line Sentinel newspaper dubbed this location as Oil City Harbor and reported 60 million fish processed in that season alone. On the eve of the Civil War, the Little Harbor Fish Pound (Leete’s Island) sold menhaden fish to farmers for one dollar per thousand. There were ten owners of this enterprise, including members of the old families of Norton, Kelsey, and Goldsmith. They caught shad and sea bass, too. Henry W. Norton’s 1865 diary records the sale of 342 pounds of sea bass to a proprietor of a nearby boarding house. Around this same time, the Benton farmers of Sachem’s Head owned all of vacant Prospect Point, where they had established a fish wharf for unloading fish from their offshore pounds. One of Connecticut’s large scale commercial fishermen during the twentieth century was Joseph (Joe) Dolan and his brother, Nook, whose bases of operation were in Guilford and New Bedford, Massachusetts. They owned five “foul weather type” vessels, designed for waters beyond Long Island Sound, such as off Labrador or in the Chesapeake Bay area. At the foot of Whitfield Street, Joe Dolan established a fish market in the 1930s (now the Moorings Restaurant) and subsequently, a new market in 1940 (formerly the Little Stone House Restaurant). 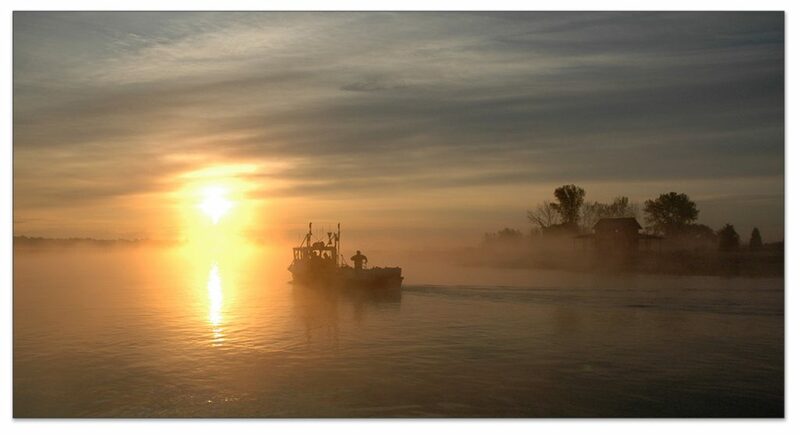 Today, a few hardy commercial fishermen still call the Guilford Marina Basin their home port, including Bart Mansi with his 42 foot Downeast Lobster boat (Erica Page), Frank Camarota with his 30 foot trawler (B Sue), Bud Harris with his 36 foot trawler (Ad Hoc), and Joel Lizza with his 42 foot trawler (Lively Lady). Yes, down at the Town Marina, formerly known as “Sluice Basin,” is still a good place to witness Guilford’s bounties from the sea. The scenes are nearly the same as yester-year; only the actors have changed.